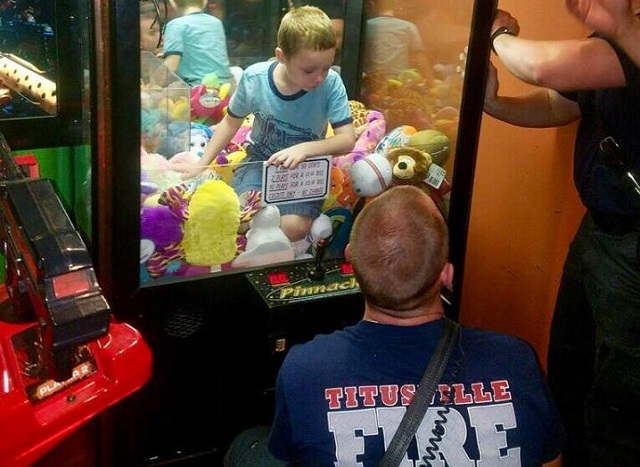 TITUSVILE, Florida - An off-duty firefighter was able to rescue a boy stuck in a claw toy vending machine at a Beef O' Brady's restaurant in Titusville, Florida. While dining with his mother Wednesday evening, Mason decided that he wanted a stuffed animal so badly that he decided to crawl into the game to get one. Fortunately, Titusville an off-duty firefighter lieutenant was in the restaurant when the boy became trapped. The lieutenant and a Titusville fire rescue crew from Engine 10 were able to rescue the boy with 'minimal damage' to the claw game, the Titusville Fire Department reported. Mason got a stuffed animal after he escaped the claw machine. Photo credit: Titusville Fire Department. Video credit: Amanda Evans via Facebook.